Mark Hopkins was a New York City bookkeeper when he caught word of gold. He immediately got himself to Sacramento and headed north to prospect. Rumors of misfortune in the mountains ahead caused him to return to the city. Hopkins scraped together a living selling supplies in the countryside. Soon, he owned a grocery store. In 1856 he partnered with K Street neighbor Collis Huntington. The two made natural allies. Hopkins' quiet demeanor contrasted nicely with Huntington's bombast. Hopkins was the paper man. He handled the books while Huntington took care of wheeling and dealing, a relationship they would later replicate with the railroad venture. His attention to business matters was absolute. "I never thought anything finished until Hopkins had seen it," Huntington said. "He never had anything to do with trade and never would. He had general supervision of the books and the papers, contracts, &c. When he said they were right, I never cared to look at them." Earnestness and frugality combined with a slight gray beard to earn Hopkins the nickname "Uncle Mark." But the unthreatening exterior disguised a resolute mind. Partner Charles Crocker would say, "When Hopkins wanted to be, he was the stubbornest man alive." Politics cemented Hopkins' relationship to Collis Huntington, Leland Stanford, Charles Crocker=, and Crocker's brother Edwin. 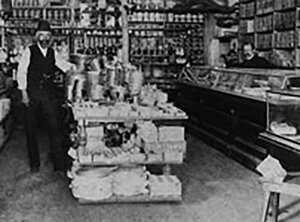 Although he began as a Know-Nothing, Hopkins shifted to California's burgeoning Republican Party, which chartered itself at the Huntington & Hopkins hardware store in March 1856. They had a difficult go at first; local Democrats invaded meetings, or accosted them on the street with shouts of "Black Republican!" All five future railroaders were in fact abolirionists, as were many of their Republican peers, but they knew a controversial platform would not get the party on its feet. So they picked something more palatable. "We are in favor," read the California Daily Times, the newspaper printed at 54 K Street, "of Frémont and the Pacific Railroad." When railroad advocate Theodore Judah caught Huntington's ear in 1860, he insisted that Congress would soon pass a railroad bill -- and it would do so under the aegis of the incoming president, Abraham Lincoln. Huntington used this logic to sell the venture to his business partner: if their small group of associates got in on the ground floor of a railroad proposal, kindred spirits in Washington might well reward them construction rights when the measure passed. All they had to do was invest in the energetic engineer. Judah would survey his route and take the findings to Capitol Hill; Huntington and Hopkins would stand to reap the benefits and control the Central Pacific. Hopkins was cautious, but convinced. He put $1,500 into the new company and assumed a place on its board. In June 1861, when the directors gathered to select their officers, the bookkeeper was, of course, named treasurer. Over the years of construction, Hopkins ran the Central Pacific finances much as he had the store, except now the market was bigger -- and the stakes higher. He still preferred to recede into the background, letting his more voluble partners deal with government, public, press, and workers. He in turn kept a sharp eye on the books, considering the financial ramifications of every move, clearing a route for the complex finances of the massive undertaking. Hopkins could be strict with his partners, refusing to endorse schemes that expanded Central Pacific holdings but distracted focus from the main line. He discouraged Huntington's speculative grabs at Utah's Wasatch coal fields. Similarly, he disapproved of E. B. Crocker's scheme to buy the Western Pacific Line linking Sacramento and San Francisco. Crocker hoped to initiate a railroad empire throughout California, but Hopkins and his abacus brain could only justify financing the nuts and bolts of the monumental construction immediately at hand. The impasse caused a rift among the Associates for weeks. But stalwart Hopkins could be persuaded by the enthusiasm of his partners; the company absorbed the Western Pacific in June 1867. Hopkins advocated deals, legal or otherwise, that made fiscal sense, and reacted in horror when the Associates made promises beyond the pale of reason. Often he scrambled to clean up the mess. In 1872, when the biggest mess of them all -- Crédit Mobilier -- called Central Pacific deal-making into question, Hopkins burned the record books. Though the Central Pacific made him very rich, Hopkins continued to live frugally. He rented a small cottage in San Francisco until his wife forced him to build a larger home, which he did not live to see completed. 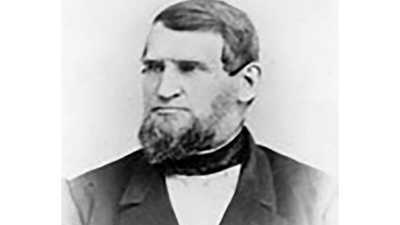 In 1878, true to his temperate nature and the enterprise that defined him, he died in his sleep aboard a railroad car. 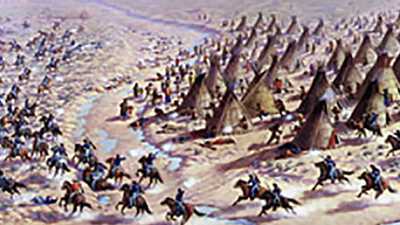 As white explorers and settlers entered Western territory, they disrupted a centuries-old culture — that of the Plains Indians.